Photographing jewelry and metal objects, or glass is very challenging. I usually do all of my own photographing of my work since I've found most professional photographers don't shoot my work the way I want it, even if I'm there in person to tweak my work. I learned to photograph the old fashioned way, with black and white film in high school, shooting, developing and printing my films and prints. For most of my artistic career, I shot a ton of slides, documenting my work over the decades. When digital cameras came along, it became harder and harder to find slide film, much less finding someone to develop them. Also, all of the major internet jury sites require digital images. I bit the bullet and got my first digital camera back in the early 2000's. I was careful to get a camera that had 4 mega pixels or more, and now that I have 2, one with 4 pixels and one with 7.2 mega pixels. The newer camera is a tiny Sony that is great for traveling and the old camera is a big workhorse Olympus. These 2 cameras couldn't be more different when it comes to shooting my work. The background color can be all over the place. 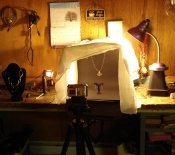 I find the old Olympus much better for shooting all of my jewelry work. As you can see, the picture above is my basic light box. It's a small 3 sided collapsible box with a black back and base. I use black or gray paper for my background, hang my necklaces from a wire brace hanging from the top, and use a black earring tree to hold my earrings. Bracelets, I generally lay on the paper, as well as brooches. As for flatware, I lay them on the paper and shoot as much as I can above. For earrings, I try to shoot straight on or slightly above, which goes for necklaces as well. I constantly move 1 or 2 lights to get the best lighting angle so all details shows up but not be washed out by too much lighting. That's why I have extra white fabric draped over the light box to diffuse the lighting even more. One curious fact I discovered with digital cameras is that they are extremely sensitive to light, while my very old but good 35mm camera with macro lens required 200-300 watts of lighting. I actually have to tone down the lighting to compensate for the light sensitivity of my digital camera. The light needs to be as pure white as possible, but it does not have to be more than 50-60 watts to provide enough lighting. I generally have to shoot anywhere from 2 to 20 images of each piece. Some pieces shoot beautifully and other pieces, I have to keep trying over and over. Some of my big brooches are a royal pain to shoot while many of the little earrings are a snap. Of all jewelry, rings are the worse. Their tiny scale requires extreme magnification, careful lighting angles and trying to keep those little suckers upright is enough to drive anyone batty. That's why you rarely see rings on my website. I'll try again in the future to get more rings posted on my site. Once I downloaded all my images, I look at how they came out, crop,and/or straighthen them and pick out the best ones to post online. Considering I was shooting images before I even started jewelrymaking, I'm very much at home with a camera and both go together well. After all, images and marketing is everything in today's digital world. I do love being able to send images on demand, take pictures before my work gets sent off to whatever it has to go. Many artists have learned to shoot their own images well, but many don't, and rely on professional photographers to do all their work. Having your work professionally shot is very expensive, and it's hard when it's not the way you like it or your work isn't posed the way it should be. I'm lucky I learned to be a good photographer and I wondered sometimes if I didn't go into jewelry, I would have been in photography. If you are wondering, it takes a long time to shoot my work and it can take a while for me to post new work online. A few days to shoot, crop, write descriptions, measure the work, and post it. It's easier for me to do a big batch of work while I have the light box, lights and everything set up for me to shoot.